The Auschwitz Institute for Peace and Reconciliation (AIPR) recognizes March 24 as Argentina’s Day of Remembrance for Truth and Justice (Día de la Memoria por la Verdad y la Justicia). This day, a public holiday in Argentina, commemorates the period of state terror which took place during the military dictatorship in power from 1976 until 1983. The annual Day of Remembrance for Truth and Justice honors those affected by the murders, tortures, and disappearances carried out during the reign of terror. Even decades after the fact, many have yet to discover the fate of their loved ones. 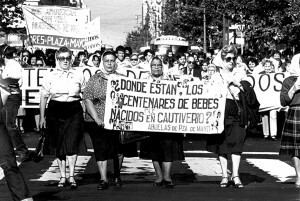 Organizations and bodies of civil society, such as the Abuelas de Plaza de Mayo (Grandmothers of the Plaza de Mayo) and the Madres de Plaza de Mayo (Mothers of the Plaza de Mayo), are joined by hundreds of others in the Plaza de Mayo each year on this day to carry out peaceful demonstrations, publicly remember those lost to the violence, and call for justice to be served. Many carry banners or photos of missing friends or family members. While Argentina’s last military junta still casts a long shadow over the country, AIPR stands united with the academics, lawyers, policymakers, and civil society members throughout Argentina who continue to work diligently to mitigate that shadow by shedding light on it. With their committed work, we see the ability of justice, truth, and memory to reconstruct a post-genocidal society in ways that prevent future atrocities from occurring again. On this Day of Remembrance for Truth and Justice, the Auschwitz Institute honors the disappeared and all victims of the violence in Argentina and applauds the work of groups like the Abuelas de Plaza de Mayo for their tireless efforts in bringing recognition to the disappeared and justice to their families. AIPR calls for increased support for mechanisms of accountability and for other efforts being made to bring perpetrators to justice and end impunity. AIPR also recognizes the political will of the Latin American region as a whole to advance in its search for truth and justice and its participation in initiatives such as the Latin American Network for Genocide and Mass Atrocity Prevention which prioritize the fight against impunity, the construction of a collective memory, and the unconditional support of comprehensive policies of memory, truth, justice, and reparations.